Dome Shelter partly obscured behind. If you followed his blog, you’d think that Craig never leaves his bike behind these days. He occasionally gets out in tramping boots though, which is great because he’s probably one of the most skilled people at off-track navigating who I know. 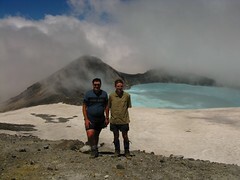 Last week Craig mentioned that after riding his bike around Ruapehu in one of those cycling events, he intended to take advantage of a truly awesome weekend weather forecast and wander up to the crater lake of Mt Ruapehu for a look. I’ve not been up that way before, and it piqued my interest enough to convince me to gatecrash. 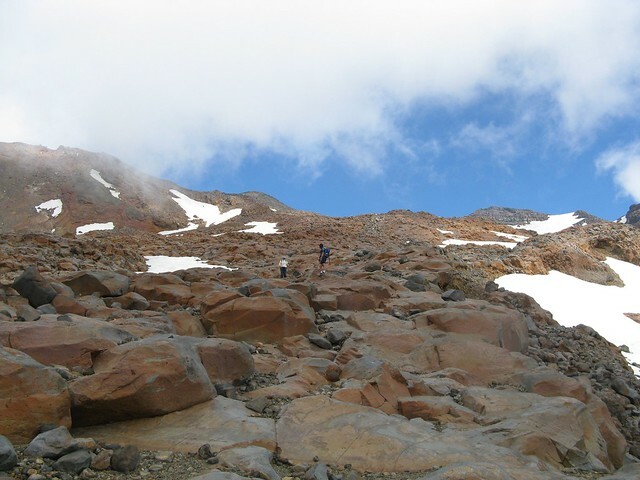 The basic plan was to go up the easy way, which is to drive to the top of The Bruce (that road up to Whakapapa Skifield), and head up from there. As a side note, we visited in the middle of summer. In winter you’d likely need alpine gear and it’s nowhere near as straightforward. It’s an un-marked route in which people can and do get lost and have accidents, and I guess in alpine environments even small problems can have serious consequences. 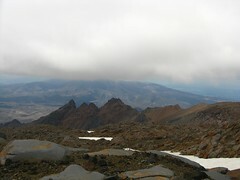 Location: Tongariro National Park, from the top of Bruce Road. 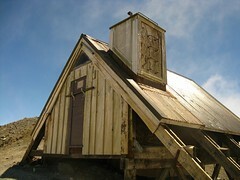 Huts visited: Dome Shelter, aka Dome Equipment Shed (0 nights). Route: Walk up from the end of Bruce Road to the top of the Waterfall Express chair-lift, then continue up Knoll Ridge to Dome Shelter at the Crater Lake. Down via Restful Ridge. Related bits: Craig also wrote about this walk. Various weekend scheduling issues meant I couldn’t leave on Saturday, and the arrangement meant dragging myself out of bed to leave Wellington at 3am, so as to reach Ohakune at about 7am and wake Craig at DOC’s Mangawhero camp-site. I really wanted to stand outside his tent and blow a whistle really loud, but he was already packing up when I arrived, and nearby campers might not have appreciated it the same way I expect Craig would have with his understanding sense of humour. At least there was still a nice climb ahead during the day. A chap visiting the camp-side from Auckland, whom Craig had befriended, seemed to think we’d knock it off before lunch time. With a 1000 metre climb, I certainly wasn’t confident we’d be up and down within that time. It’s roughly an hour’s drive from Ohakune to the Whakapapa Skifield, and after miscellaneous preparation (things like breakfast) we arrived at about 9.15am or so. There appeared to be some things happening in the parking area as we drove up, including some police and a helicopter buzzing around. We didn’t find out until later that it was all to do with a search and rescue operation for a Greek man who’d become lost the day before, and spent the night wandering on the mountain. It fortunately eventuated happily as they found him about half an hour after we left, which would have been a combination of good search coordination, and an element of luck from the overnight weather. Anyway, the two of us elected to not use the chairlift from the top of The Bruce (we were out for a walk and didn’t want to pay for it). At our pace this meant an extra hour of walking to climb the 400 metres. It was quite easy to pick a route, in which we mostly stayed roughly under the main t-bars and waved to the rich spenders cruising overhead, occasionally informing them of the great things they were missing by choosing not to walk. The whole area around here is reasonably built up, with a combination of ski-field structures and mountain lodges that generally belong to various tramping, alpine and skiing clubs with occasional exceptions. It’s unusual for a National Park, but doesn’t bother me here as much as it seems to in some other places. The Waterfall Express from below. Craig and I took photos of each other after an hour, where a new cafe is being built, thus documenting evidence that we’d been able to reach the top of the chair-lift and had made it at least as far as most other people that day. From there on, we took another look at the map in an effort to figure out where we should actually be going. There are two particular routes which we’d read about, neither of them marked but both often walked. One is the Knoll Ridge T-bar, which is the ski-tow route slightly to the right when heading up and out of the chairlift. The other is Restful Ridge, further away to the east. Neither of these is marked by name on the LINZ Topo50 map, so we applied some intuition as to which ribs our written description was referring to, and followed the route up Knoll Ridge. Knoll Ridge is easy enough to follow for the length of the tow-line. On our right, to the west, a creek flows down the valley beside Knoll Ridge, eventually becoming Whakapapanui Stream. Much of the way to the top of the mountain, Pinnacle Spur dominates the view to the east, with its ominous jagged edges, and we saw at least three distant people silhouetted against the sky up in that direction, although I suspect they didn’t walk along the spur so much as climbed to the upper end of it where it’s flattened out. At the point where the ski-tow ends, Knoll Ridge drops into a slight valley, where having dropped off the end we began to encounter our first mild patches of icy snow. For much of the time we hopped along the moraine alongside, which I often personally prefer because I find it easier to walk on, but the snow itself wasn’t too awkward. 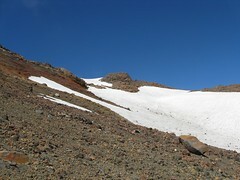 saddle into the summit plateau. Climbing starts getting more steep after Knoll Ridge, and the route curves slightly west of south underneath Glacier Knob, towards a saddle that eventually enters the Summit Plateau of Ruapehu on the western side of Glacier Knob, although at the time we didn’t have this information too specifically. 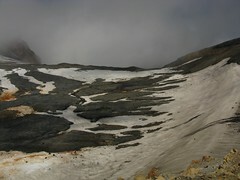 During the summer season when we visited, it’s a climb up scree and moraine, and remaining patches of snow also added to the walk. The snow wasn’t too bad and although it took a few minutes to get back into the swing of kicking steps into the snow, which I’ve not had to do for a while, it was generally an easy walk. We stopped for a break at about the 2450 metre contour, at the time not being certain of the actual route. A chap ahead of us who didn’t seem terribly confident had decided to sidle around over some more ice towards the gap next to Glacier Knob, but on the limited information that we had, and with neither of us having been here before, the two of us weren’t certain at the time that it was an optimal route. Following some lazing around at about 11.30am, the two of us decided to follow some gut intuition, which suggested getting to the top to walk along a ridge sooner rather than later was likely to make more sense than sidling around for a long time. 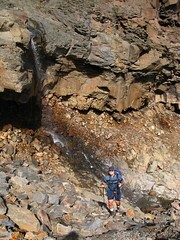 The outcome of this decision was a very direct line busting straight up the scree. With a start and stop scrambling effort, I reached the top at about 12.30pm, delighted to see the ice-covered plateau below me on the other side, with the top of Dome Shelter showing in the distance. As I waited another 15 minutes for Craig, I had a chat with a visiting British couple, whom we later found were named Jane and Graham, and who’d somehow found a route that dropped them on the eastern end of Te Heuheu Ridge, possibly up the Te Heuuheu Valley somehow. On seeing me arrive straight up the scree they commented that I must have come the “right” way, which I take to mean that their on route hadn’t been much less labour intensive. Despite being a calm day, some thick-ish cloud was drifting in from the north, behind us as we’d climbed. When Craig arrived in front of the foggy back-drop, we followed a few minutes behind Jane and Graham, and met them once again at Dome Shelter — the small hut on the edge of the Ruapehu Crater Lake. Strictly speaking, I think it’s now called “Dome Equipment Shed”, probably as part of efforts to discourage people from sheltering there, as the shelter itself (which contains volcano monitoring equipment) is supposed to be for emergency use only. Although it’s known for people to stay at Dome Shelter overnight, the rule against doing so is for good reason. 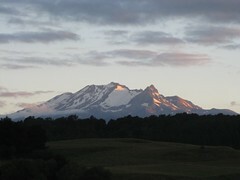 Despite its popularity, Ruapehu is still an active volcano. 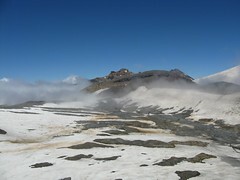 Its last major eruption, which sent minor lahars flowing down several valleys on the mountain, was in 1995. Even outside major eruptions, however, the region around the crater lake is dangerous. 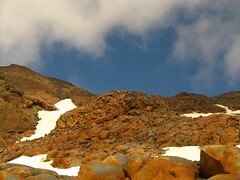 Dome Shelter has a history of being destroyed and damaged by volcanic activity, most recently in September 2007 when the volcano burped, boulders landed on the shelter and a tramper who’d been sleeping there eventually lost his leg. He was a very lucky guy. equipment, and is for emergency use only. With the cloud not playing nicely, it was a while before we had a reasonable view of the crater lake, and even longer before we could see the high point of Tahurangi (2797) behind it, which we didn’t plan to visit on this occasion. As we ate lunch, the clouds parted and features gradually began to come and go. The crater lake itself is currently bright blue, with acidic water. On seeing it, it’s hard to imagine that it’s been used for swimming in the past. 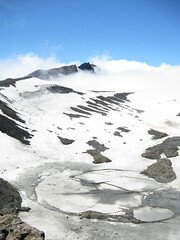 The acidity of the lake varies over time. a bright blue crater lake. All four of us sat around for some time, discussing topics such as boot retailers in Taranaki. 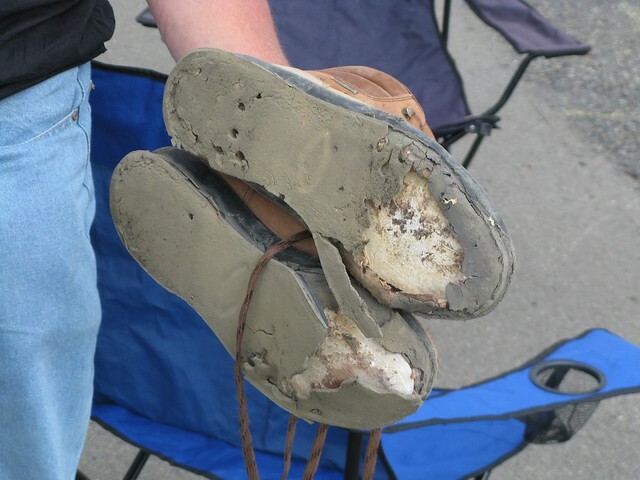 Graham was having problems with the soles of his 10 year old boots beginning to fall apart, apparently after an encounter with the scree. Graham and Jane eventually left, and 15 minutes later, about 2.15pm, Craig and I picked up and left too. I think we may have been the last people at the crater lake on that day. 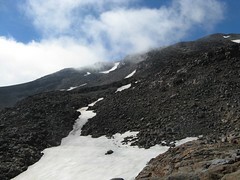 The Summit Plateau is a fascinating sight in the looming cloud with its dirty ice and volcanic-shaded rocks, and I took it in as we walked back along the ridge above to the eastern side of Glacier Knob. It was tempting to wander down for a walk around, but it looked as if it could potentially be tricky to get back up without a lot of time. At the small dip below the knob, we joined the walked track that we probably should have followed to come up. (It was nowhere near as exciting as our own route, however.) Rather than sidle around to the top of Knoll Ridge where we’d left off on the way up, we instead followed the walked track slightly west-wards, into a snow basin that allowed some fun skidding down the snow, and eventually onto what we later confirmed was Restful Ridge. There are some wonderful orange and brown colours in the volcanic moraine of this region, and I think I could quite easily just sit and enjoy on another occasion. During this time we caught up with Jane and Graham, however, who were not completely confident walking through the snow and moraine. The boot problem wasn’t helping, and combined with some exhaustion, they were beginning to realise there was some risk of missing the 4pm closing time of the chair-lift. Consequently we walked down with them, since although the current conditions were fairly calm, both Craig and I were of the opinion that in such conditions it’s a very bad thing to leave people behind. Pinnacle Spur in the distance. This was a good thing in the end, because after some intermittent separation around rocks and small ridges of moraine that obscured vision, Craig and I noticed that they had probably headed a bit too far down the ridge without veering off towards the top of the main chair-lift, not having realised that the one they needed to aim for wasn’t in view, and that they were actually dropping into somewhere quite different, so we dropped down through some rocks and caught them. Jane in particular wasn’t feeling the best, to the extent that getting back up the ridge to a good turn-off point wasn’t much of an option, and also that movement was by now probably about a third the rate that it would normally be. Over the next hour or so, I eventually hopped ahead and found a quick-ish route through the moraine, dropping down in front of the NZ Alpine Club hut and then running to the top of the Waterfall Express (chair lift), fortunately managing to catch the chair-lift guy a couple of minutes after closing time, and managing to convince them to keep it running for a little longer, while Craig stayed with them and made sure they didn’t get into trouble. The chair-lift operating people at Whakapapa Skifield in the summer were very helpful with their consideration, and they stayed behind long enough so that when Craig, Jane and Graham eventually walked up some time after 4.30pm, there was still a chair-lift able to get them down the rest of the way. Craig and myself had intended to walk the rest of the way down, as we’d come up, but Jane convinced us that we should go down with them so they could make us some tea in their camper-van, which was perfectly wonderful. It turns out that the chair-lift at Whakapapa Skifield is free if you’re going down instead of up, which is excellent news for future reference because I enjoy chair-lifts. I just happen to dislike paying for public transport if I can walk as an alternative. It was 5.30pm by the time Craig and I actually left the top of Bruce Road, and with some dinner and a brief snooze along the way I arrived home just slightly before midnight, thereby reinforcing my belief that this had been a daywalk. It was certainly an interesting daywalk, partly from the volcanic landscapes but also with the events that unfolded towards the latter part of the day. It guess it emphasised just how easy it can be to become confused on the side of what’s a very accessible mountain near the tourist trail, especially given how many people who are encouraged to visit are often expecting something more graded and artificially safe. Despite the immediate area being relatively built up with T-bars designed for the ski season, the area is still massive and a person in slowly moving through it in the distance can be missed quite easily. Undulations in the terrain make it easy to completely lose sight of landmarks, potentially wander off on the wrong bearing, then end up in places that aren’t necessarily easy to get out of. Then all it’d really take is for darkness or clouds to drift in reducing visibility, and one could end up completely disoriented. The remains of Graham’s boots. They did actually start with soles, which came off through an encounter with scree and then he was walking on socks. 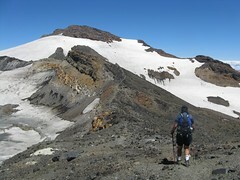 This entry was posted in daywalk and tagged bagged:dome shelter, daywalk, independent trip, moraine, screeeeee, search and rescue, snow, tongariro. Bookmark the permalink. thanks mate, been decades since i’ve been up, refreshes my memory for my trip up this weekend. No worries. Glad it was helpful.